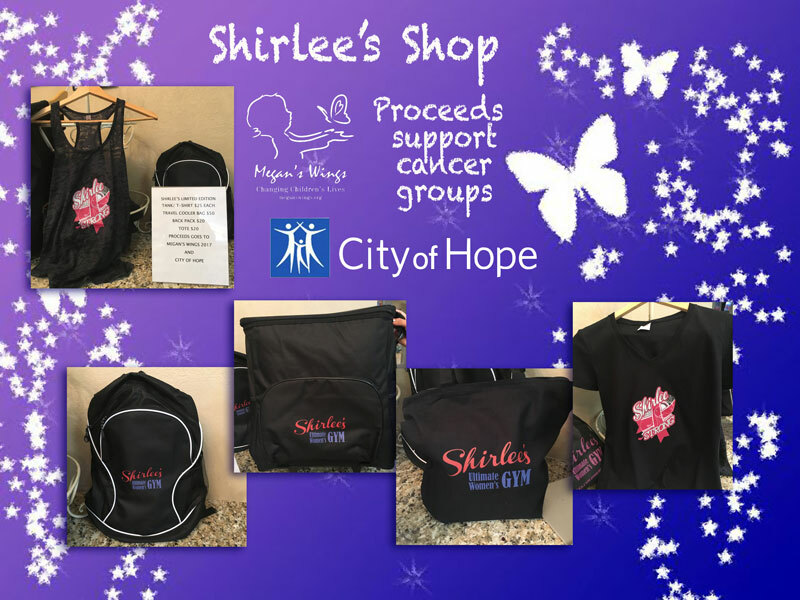 Shirlee’s Ultimate Women’s Gym is proud to support two organizations dedicated to helping cancer patients and their families: Megan’s Wings and the City of Hope. At the front desk we are now selling a variety of Shirlee’s merchandise, and proceeds from the sales will be donated to these two worthy nonprofits. Megan’s Wings is a volunteer-based foundation in Upland established in memory of 9-year-old Megan Savage, who lost her battle to Leukemia on April 2nd, 2003. Megan’s Wings provides help and services to local families of children with cancer. Last year Shirlee’s was a sponsor at Megan’s Wings 5 K Run. City of Hope is a world leader in the research and treatment of cancer, diabetes, and other serious diseases. Donations help turn innovative ideas into cancer treatments. Shirlee’s has been supporting the City of Hope since the gym opened with blood drives and fundraisers. Thank you to our members for helping us to support these and other health-related community groups. Our special sale includes t-shirts, tank tops, bags, backpacks, and a cooler. Stop by the front desk to purchase merchandise. Thank you for supporting the health of our community. This entry was posted in ShirleeStrong and tagged cancer, City of Hope, community, fundraising, Megan's wings, merchandise, shirlee's tshirt, Shirlees gym. Bookmark the permalink.